When the note came through of the Pennine Region’s planned Henge Meet muppethad me didn’t quite cotton on to the location or meaning of the name. The Meet was held at Camp Hill a fantastic sort of outdoor centre not that far from the strangely little known Neolithic Thornborough Henges. Despite being more evocative than Stonehenge as a result of their puzzling alignment but mainly because so few people go there, they did enjoy a brief moment of fame a few years back when a campaign was launched to stop the nearby quarries destroying even more of the ancient site. Fortunately it was successful and the strange line of Henges dating back to at least 1800BC has now been protected from further incursion. Now, had I twigged that then we would have been there. Elaine Smith kindly sent us this resume of the events and I would hazard a guess that next year you may need to get your entry in a tad earlier especially if they organized a Henge Hop for Hoppers as well. Now that would be a thing. Pictures courtesy of Steve Hollingsworth. Camp Hill is a beautiful house near the village of Kirklington in North Yorkshire, owned since the 1940’s by the Ropner Family, and has developed over the last 14 years under the care of Robert Ropner, consequently, it must now be one of the brightest gems in Yorkshire’s crown. Camp Hill is no longer just a stunning family home but now plays host to a conference centre and an outdoor activity centre with a multitude of things to do to keep you out of mischief; from the now famous Aerial Extreme - a death defying stroll through the tree tops for those of courage, and on all sorts of imaginative ropeways, zip wires, swings, and rope bridges, to the inspiring little Hobbit huts hidden in the trees, and the Yurts in ‘Yurtshire’. These are all part of the new trend for ‘Glamping’; upmarket glamorous camping. There are also practical if not glamorous, camping barns, uggings of beautiful woodland with many varied species of trees, ponds and meadows with wild flowers, and all manner of activities taking place around the 240 acre site, everything from water Zorbing (giant see through plastic balls in which the participant tries to walk on water), quad bikes of all sizes, off road Segways, shooting, Rage buggies, an equestrian centre, a conference centre, den buildig, laser combat, falconry, adventure playgrounds, a crashed plane on an island , and other team building challenges, topped off with a lovely café situated at the hub. Our event documentation pales into insignificance at the side of their risk assessment file which is, apparently, over a foot thick, and rightly so – each ‘t’ is crossed and every ‘I’ is dotted as you can well imagine with such thrilling activities in which to take part. Looking after and instructing the participants are a team of highly skilled people all led from the front by the owner of Camp Hill, Mr Robert Ropner. Robert appears to be a ‘hands on’ leader and was cutting the grass on his ride on mower when we arrived on Friday, but he soon came over to say hello and welcome us onto site. The first contact email to broach the subject of a potential balloon meet was met with excitement from the Camp Hill team, including Robert, and it wasn’t long before he was on the telephone to discuss it further. He was so excited about the prospect of hosting a hot air balloon meet that he booked us in on the only date we had available in June, and without even thinking about what else might be going on on site that weekend, the other event being a wedding in Yurtshire with the majority of the Hobbit huts and Yurts already having been booked by the massive number of wedding go-ers! So with a rapid change of actual location we were booked into the field previously occupied by a Maize maze which last year only grew to the height of 4ft due to the rain, and was consequently, described by Robert as being a bit more agricultural than he would have wished for us, but it was perfectly fine, and really well placed on site for us to watch the quad bike safaris disappear into the woods and hear the shrieks of the people on Aerial Extreme. The Hobbit huts are cute, little round huts with wooden shingle roofs and pretty little windows and doors, and they are quite well hidden in the trees. At first you may just spot one, then another and another. The Yurts, of the type found at Camp Hill in the woods of North Yorkshire, rather than the Steppes of Central Asia, are traditional tent like structures with log burning stoves in the centre, again these are not easily noticeable at first with them being hidden away, in the woods, but they are absolutely perfect for a relaxing break which seems somewhat paradoxical in such a lively place. Camp Hill as a whole – the venue, and the people, came across as such a happy place. The family, the staff and the instructors all muck in and clearly like what they do and more importantly, like each other. That shines through in abundance. 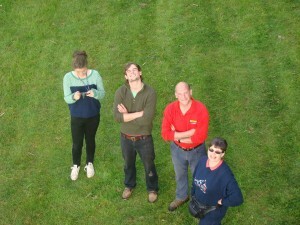 In particular Mike, Tom and Laura (who asked us if we had heard her squealing as she was test pilot for the new zip wire under construction!) were more than happy to help us out with anything we needed, and it was great to feel so welcome. This was patently obvious to all of the PRBA members as many commented on the atmosphere being so welcoming, relaxed and enjoyable right from the very first moments of the very first Henge Hoppers meet. Even the horses in the equestrian centre took the noise and disruption of the balloons in their stride, and enjoyed a canter around their fields in sheer excitement. Stories were told to us of the funny things that go on at Camp Hill, such as Robert’s 86 year old father who dons his goggles and takes to one of the motorised mowers to try to beat his own personal best each time he cuts the showfield grass, much to the chagrin of the groundsman who was dismayed when the speed demon went so fast as to break the mower! Even with so much to do on site, we were there for a balloon meet and Friday gave us a beautiful sunny evening but the wind would just not drop out sufficiently for the balloons to fly, so a bit of a disappointment there. 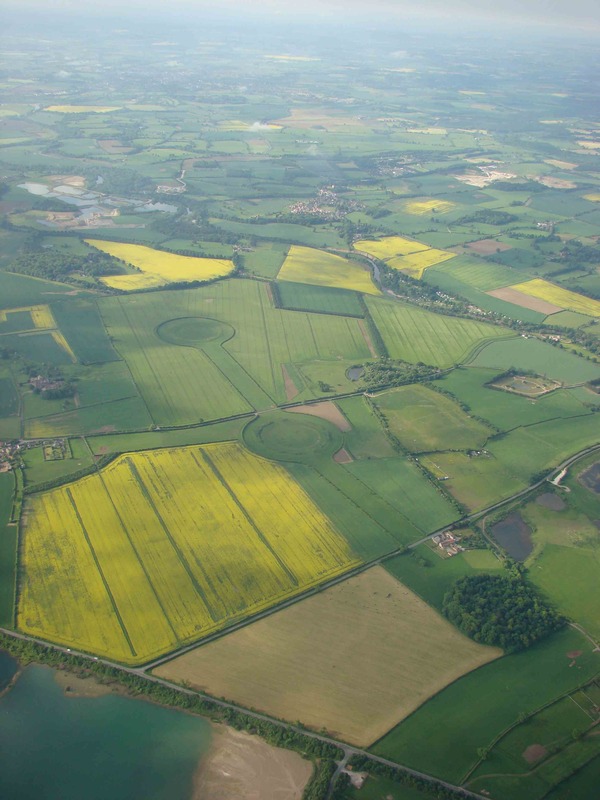 However Saturday morning made up for it with perfect conditions, and the wind taking us to the south west of the site - directly to the Thornborough Henges. Robert came along to watch and gave up his promised basket space (saying he would wait until next year - invited back already!) to his children, who he had to telephone to get out of bed at just gone 6 a.m.; Max having only arrived the night before from working in London, and Poppy fresh from arriving home from University! First to take off was Mike Bellamy and Steve Hollingsworth in ‘Springtime’ (G-BVDB) who subsequently took the top 18 inches off a nice Quercus Robur (English Oak) as a little trophy of their own, followed into the air by Neil Beckwith and Phil Traviss in Roxi (G-ROXI) and finally by Alex Smith with Max and Poppy in ‘Ode to Joy’ (G-OATV). Ray Wright had also booked in with G-LEGO, kindly loaned to him from Phil Traviss following the sad demise of Polar Wind, but he subsequently decided to attend Andy Marshall’s great new idea of ‘Hot Air Games’ at Welshpool. 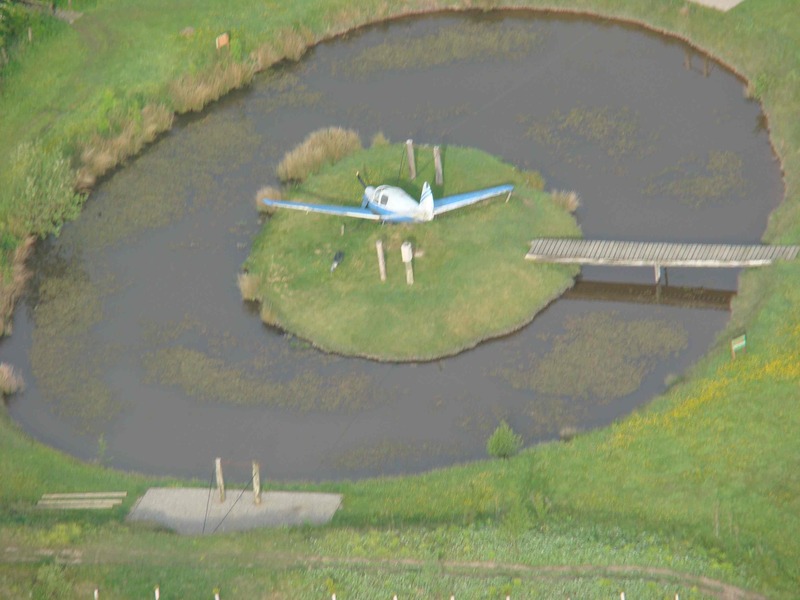 Mike and Steve flew over the Henges to land at Aldburgh Hall in spectacular style, incorporating a handling line, a very substantial gatepost and a swing of 90 degrees into a landing field! 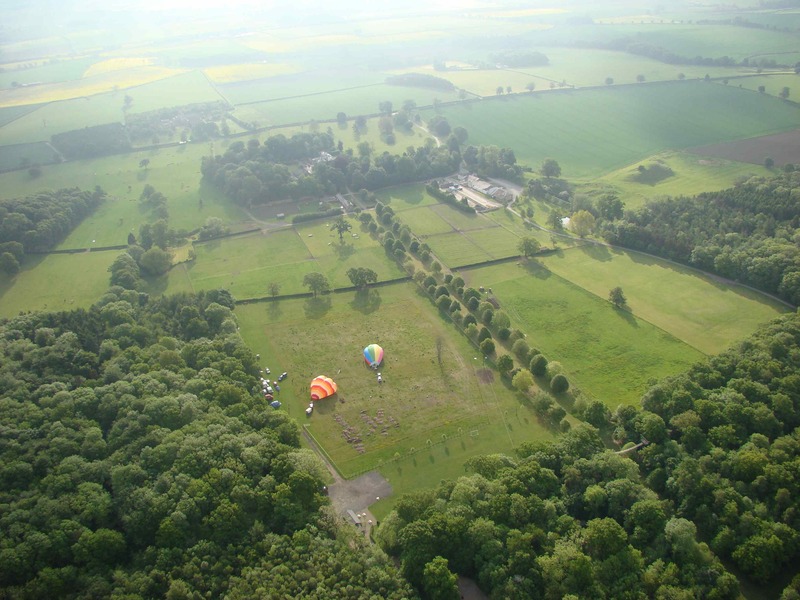 Alex flew low over the trees and into Yurtshire with the assembled wedding guests who were waving and clearly enjoying having the balloon buzz them! Both Max and Poppy were amazed at the controllability of the balloon as Alex flew low over a bean field and hopped onto a hedge top to check out the landing site he had chosen as it was rather long grass set aside. Alex didn’t fly as far as the Henges so took second place to Mike and Steve at that present time. Neil and Phil had a relaxed flight with Neil as Pu/t and they hopped the Henges and landed a mere handful of feet from the wooded Henge, one of the outer two of the three rings. Leader board pole position claimed! Everyone came home safe and sound and gassed up, breakfasted and then chilled out in the glorious sunshine. 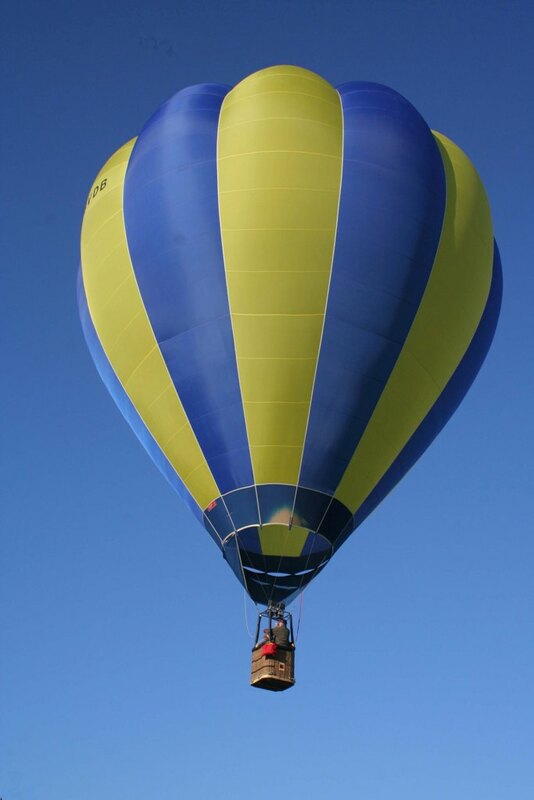 Saturday evening briefing was postponed but the breeze was not going to drop out in time, so a pub crawl for some, and a lovely evening all round, culminating in Messrs Court, Traviss, Bulloch, Trowbridge et al, scheming to pinch our balloon (Alex had gone to bed….lightweight!) to go and tether at the wedding party which was in full swing with a live band. 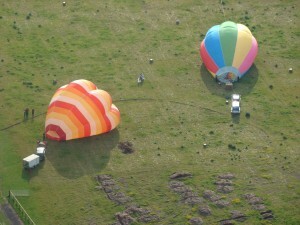 I did point out that Mike and Steve’s balloon had a soft top trailer so could be accessed easier than ours……. Sunday morning arrived and we were pleased to see all trailers still where they had been parked the previous evening, and that’s is where they remained apart from G-ROXI, however the morning was misty and overcast with an inversion not lifting as planned and a naughty little shower arriving four hours early to boot. This was quite a blow for Neil as he had planned his Check Flight with Dave Court, but all he got was a wet balloon for his efforts. The balloon was packed away and the rain abated, but it was a good decision as a heavier shower followed shortly afterwards. Neil was understandably disappointed, as were we all for him so we hope to hear good news from him soon. The rain left and the sun shone thereafter, thankfully drying out tents and awnings ready for packing away. It was even more important though for the Segway safari undertaken by Phil Traviss, Alex and Barnaby Smith. Off they went to the Segway training area and 20 minutes later they arrived on the launch field with Phil flat out in reverse gear and a huge grin on his face, closely followed by Alex, Barnie and their instructor, all too with big grins. They all loved the Segways and gave us all a good laugh as they sped off again, moving along behind a hedge smoothly as though they were on a huge motorised walkway. The debrief at 12.03pm or 11.59am, or 12.05pm, or maybe even 12.07pm (in joke!) had the crowd of us gathered together to hear that the ‘Henge Hopefuls’ (Phil Traviss and Paddy Donkin) won the ‘Name the Prehistoric Film’ quiz, and received a Lego lookalike quad bike (a bit smaller than the Camp Hill ones). Phil, ‘Mr Lego’, had to soil his hands to take his prize, his face was a picture! The ‘Name the Henge’ quiz was tied between Phil and co, and the Springtime team of the Bellamy’s, so as Phil and Paddy had already triumphed in one quiz, Michelle took the prize. That just left the new Henge Hoppers trophy to award, and as Phil and Neil remained top of the leader board they lifted the silver cup. Phil accepted it on behalf of them both as Neil had already set off home to London via a stop to dry out G-ROXI. With an invitation already in the bag for next year, basket spaces booked and the consensus of opinion was that it was such a great venue, there are only a few words that are sufficient………..we’ll be back! Many thanks to those that joined us, it was just how meets should be, with maybe a bit more flying next time. Elaine and Alex Smith. http://thornborough.ncl.ac.uk/index.htm The Thornborough Project’s website. www.camphill.co.uk/ All about the venue. Smashing!